God Gave Us Family Book Deal On Amazon! This is a wonderful deal for this Summer especially if you are looking to explain meeting up with family this year with your little one. Little Pup’s wolf family is on their way to a special reunion—with lots of cousins, games, roasting marshmallows, and fun! 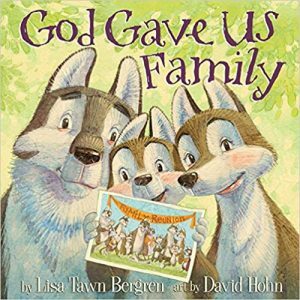 As the young wolf thinks about different kinds of families, it’s the perfect opportunity for Mama and Papa to teach their inquisitive child about the families that God brings together. Some families are big and others are small, some are led by grandparents or just one parent, and some families include adopted little ones– yet each family is truly special.